Nahiku Cove made our list of the most intriguing Maui beaches for many reasons, not the least of which is its untamed beauty. starting just before the turn-off along the Hana Highway. This "beach" consists of a wild and rugged rocky shore and is located in a peaceful, secluded little cove. And the view of the ocean is breathtaking! AND, according to www.dictionary.com, one of the definitions for "beach" is "the area adjacent to a seashore." Nahiku Cove is DEFINITELY adjacent to the sea! Well, regardless of whether or not this is a REAL beach in the sandy sense, it's still one of our must-see beaches in Maui. Do you need MORE than just a fantastic ocean view to make it worth the trip? I am a sucker for waterfalls, and this little cove even has those! You can't see them from the beach, but, you only need to walk a short distance to get to them. I generally don't like the driving part of getting anywhere, but this is one drive I would NOT want to miss! 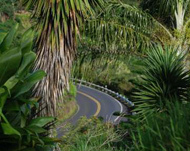 The 3 mile drive from the Hana highway to the cove is absolutely amazing - the narrow road is surrounded by tropical flowers and lush jungle greenery! There are even rubber trees along the road, remnants of an old rubber plantation from years ago. Also, en route to Nahiku Cove, you'll pass what's left of the old Hawaiian village of Nahiku. 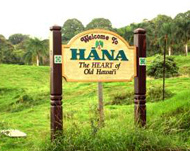 It's located off the Hana Highway - you take the turn-off onto Nahiku Road, just past mile marker 25. The cove is situated on the East side of Honolulunui Bay. For more detail, please refer to the interactive Google map, below. A caution: After heavy rainfall, flash flooding of the roads leading to Nahiku cove can occur. On a practical note, you should know that there are no restroom facilities at this beach. 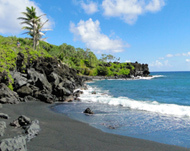 Also, (you may have figured this out already,) Nahiku Cove is NOT one of the Maui beaches that you would want to swim at. This is more of a relax-and-soak-up-the-scenery type of beach!